The other week I was setting up a game with a local club mate, Elliot, for the weekend and we started discussing what battleplan to use. I had just finished a tournament a few weeks before, so I had been mostly sticking to Matched Play scenarios. Since this was just a casual game, with no looming tournament to prepare for, I decided why not give something else a spin? I remember back before the first General's Handbook when I would often use battleplans from the Battletomes or the Realmgates War books. Remember "The Altar" battleplan? With that in mind I started to think about what we could do to spice up the game and break us out of the "Which Matched Play scenario are we playing" mold. 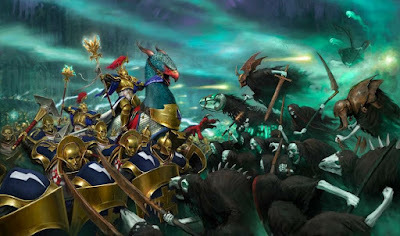 We knew what armies we were bringing, Nighthaunt for me and Stormcast for him, so the first thing I did was take a look through those Battletomes. 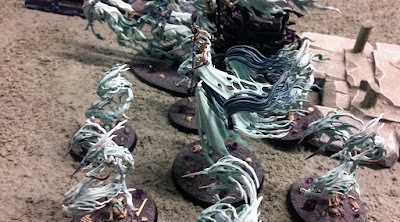 The Nighthaunt one didn't really fit the type of game I wanted to play, since it had the ghosts acting as ambushers with an odd deployment. It's definitely one I would like to try at some point, but not for this game. As I was looking at my collection of AoS rulebooks trying to decide which to look through next I found my deck of Open War cards. These were perfect since it would give us something different to play, with no way for either of us to prepare and tailor our lists to it. I've used the Open War cards before, and they really are a ton of fun. Worst case scenario, if you draw a card you don't like, just pick another. You're not bound to the first cards you draw. While this definitely switched us out of the Matched Play field house, it still wasn't narrative enough for me. Grabbing the General's Handbook 2018 I started reading through the Open and Narrative Play sections again. It's in the Narrative section that I found what I was looking for. There is a whole section of just narrative hooks with cool rules that you can incorporate into your games. There's no method for picking these, it's really just using the ones that you like. Since it was going to be Stormcast versus Nighthaunt it seemed only fitting to pick something centered around the Necroquake. After a quick flick through I found the Necroquake Tremors and Storm of Magic rules that fit the bill perfectly. I could definitely picture our two forces clashing shortly after the consequences of the Necroquake began to surface. To make it even better, I was taking the Purple Sun Endless Spell for a spin which fits nicely into that storyline as well. On the day of we decided to roll for the Realm since the logical choice, Shyish, may have given me too much of an unfair advantage. Elliot had set the board ahead of time with plenty of graveyard scenery, perfect for our game. We still used points and the rest of the Matched Play rules, but just by tweaking the battleplan it felt like a whole new game. 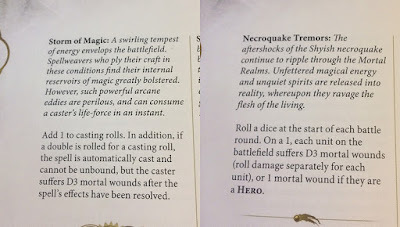 While the Necroquake never came into play due to a lack of rolling any 1s, the Storm of Magic certainly did, with Lady Olynder rolling doubles almost every turn, ensuring her spells went off unchecked, but also hurting herself in the process. I had a ton of fun using this combination of narrative hooks and Open War cards and definitely plan to use them again in the future. 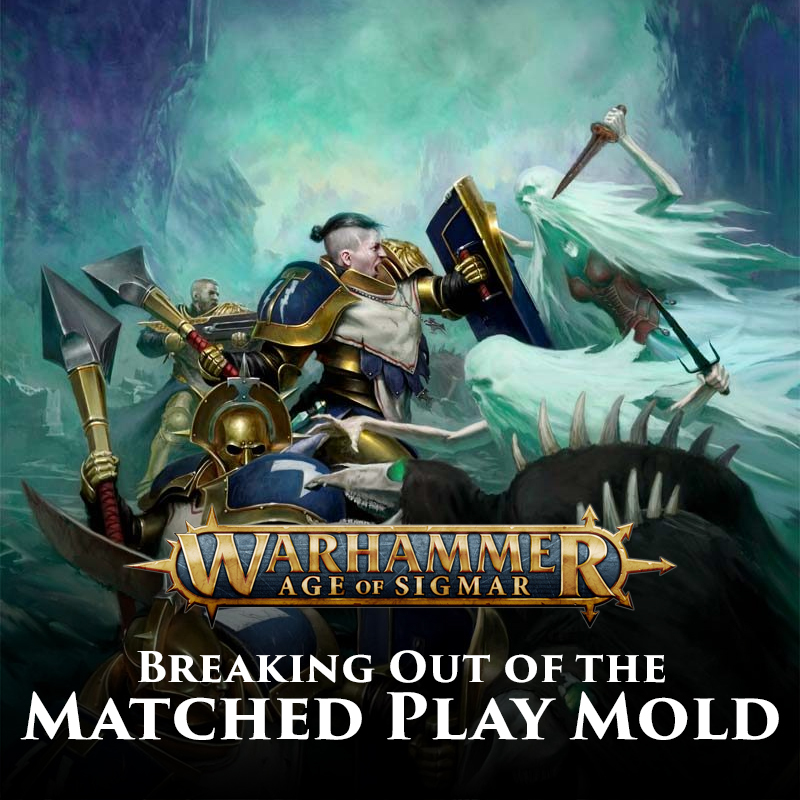 I won't stick exclusively to this, and will probably swap some of the Matched Play scenarios into the mix as well, especially once Adepticon starts getting closer. Variety is the spice of life, as they say, and even with 18 Matched Play battleplans to pick from, you have a whole host of other battlelplans just waiting to be used. If you haven't looked through the Narrative section of the General's Handbook either I definitely recommend giving it a read. Especially that narrative hooks section, which even I probably glazed over in my first read through. It offers so many fun little rules to really make each game unique. What are some of your favorite non-Matched Play battleplans or games that you have played in? 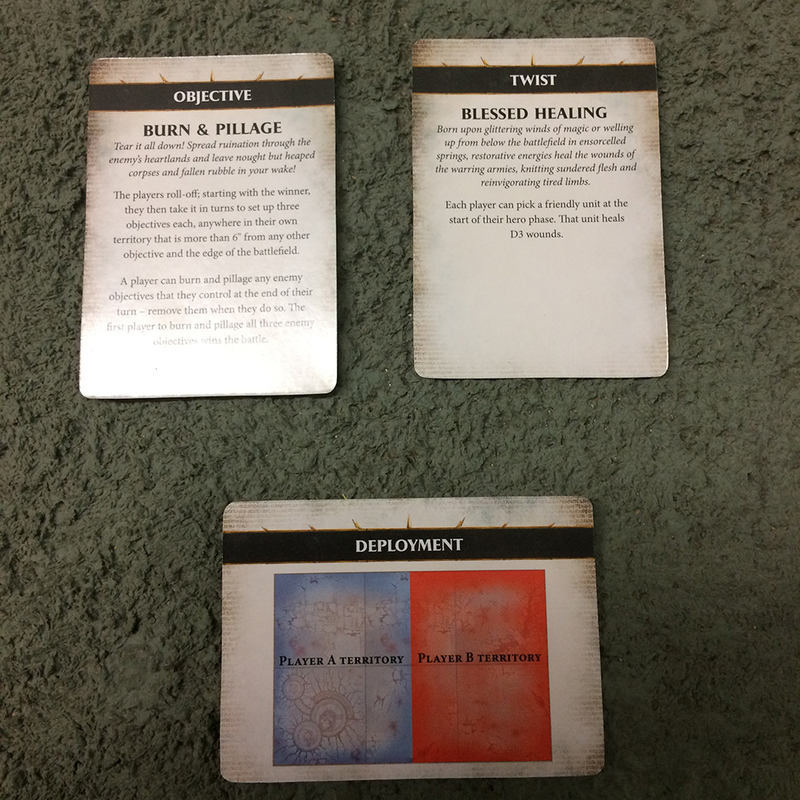 Do you use the Open War cards or play the battleplans from the Battletomes? Let me know in the comments below!